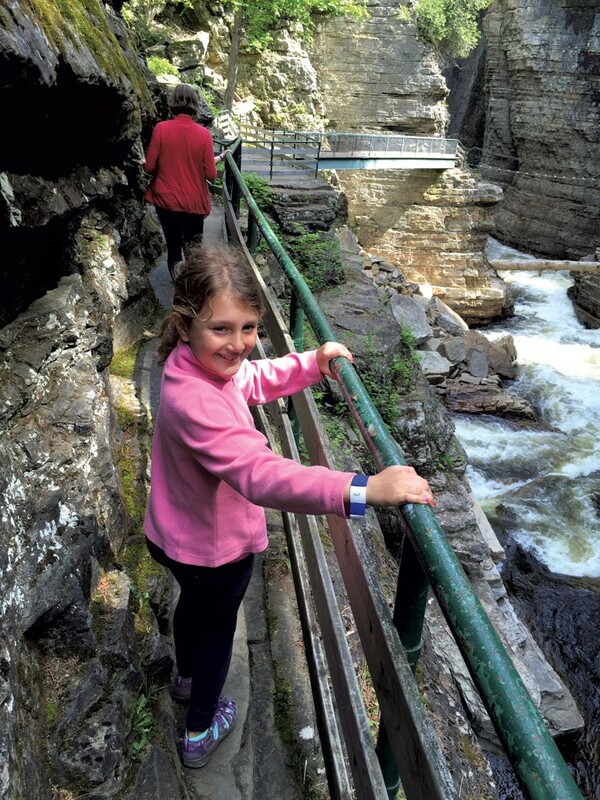 Vermont Day-cations: Ausable Chasm & Dog Mountain | Features | Kids VT - small people, big ideas! 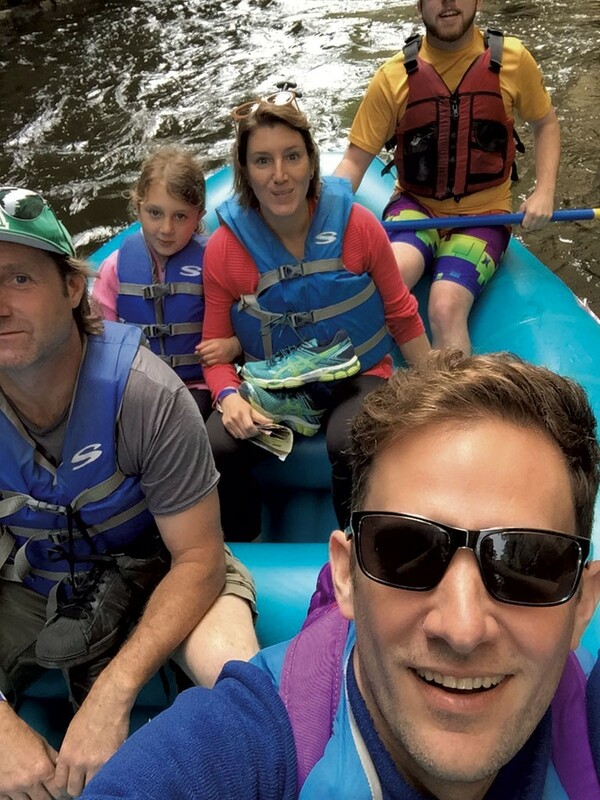 School's out, and "Day-cations" are in. 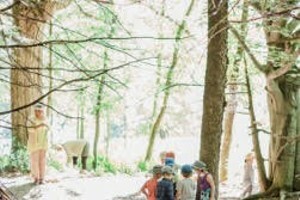 Every summer, Kids VT seeks out family-friendly destinations where you and your kids can experience the natural beauty and unique culture of our region. They're all places you can visit in a day. Each of our three summer issues features two recommended trips, complete with tips on nearby dining and attractions. 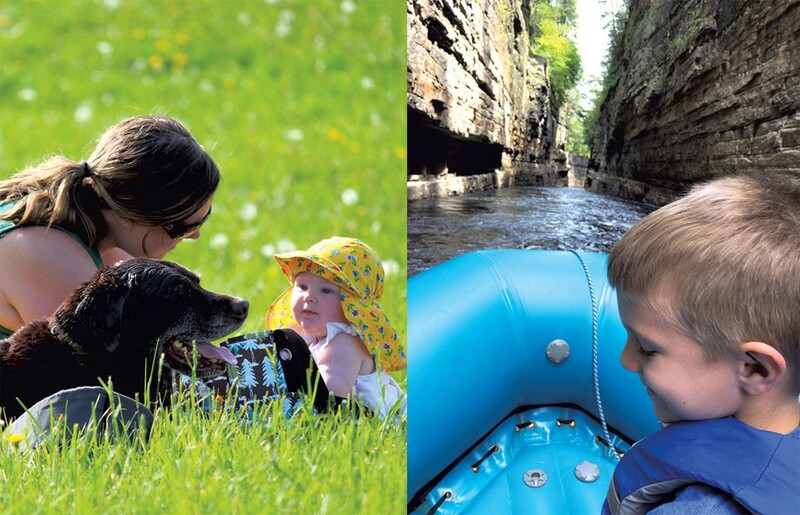 This month, managing editor Alison Novak takes her crew across Lake Champlain to see the natural wonders of Ausable Chasm, while contributor Sarah Galbraith brings her family — including chocolate lab Odin — to Dog Mountain in the Northeast Kingdom. Looking for more day-trip ideas? Read the rest of our award-winning Day-cation series at here. Ausable Chasm, 2144 Route 9, Ausable Chasm, N.Y. I might as well have said we were going to Timbuktu when I told my kids — 8-year-old Mira and 5-year-old Theo — that we were taking a day trip to Ausable Chasm. "What's that?" they both asked. "It's a fun place in New York, on the other side of Lake Champlain," I explained. "We can hike cool, rocky trails and ride on a raft." To be honest, I didn't know what to expect myself. The Ausable Chasm website touts the attraction, gouged out of sandstone by a glacier millions of years ago, as "the Grand Canyon of the Adirondacks." I suspected that, as with most natural wonders, you have to see it with your own eyes to get it. We embarked on a perfect Sunday morning in June, with temperatures in the low 70s, arriving at the Charlotte ferry dock just in time to catch the 9 a.m. boat. We spent the 25-minute trip outside our car on the deck, the wind whipping our hair, cool lake water spraying up at us. It was so pleasant that my husband, Jeff, and I wondered why we don't take the ferry more often — just for fun. The boat docked in Essex, N.Y. From there, we drove half an hour north to the chasm. At first, the woodsy roads had a decidedly summer-camp feel. By the time we hit Keeseville, though, the surroundings seemed less idyllic. The federal building was missing an "L" (making it the "Federa Building") and many storefronts were empty. "This is like the land time forgot," Jeff remarked. "Are we in a zombie apocalypse?" We hadn't met any undead invaders by the time we reached our destination. There weren't many living visitors there yet, either. From the nearly empty parking lot, we glimpsed sheer rock walls and a huge, powerful waterfall. Grand, indeed. We stepped into the welcome center, a large facility with a cafeteria, gift shop and ticket counter. There we bought passes for the family-friendly Classic Tour. That includes access to scenic trails plus a raft ride through the narrowest part of the chasm. Two different trails lead down to Table Rock, where we'd commence our raft ride on the Ausable River: The two-mile Rim Walk is an easier, mostly flat, wood-chip-covered trail, while the one-mile, intermediate-level Inner Sanctum Trail runs along the edge of the chasm, over natural stone walkways, up and down staircases and across bridges. We opted for the latter. The 30-minute walk along sheer cliffs — with a roughly 40-foot drop to the water below — took us all out of our comfort zones, especially cautious Mira. But the trail is well maintained and the guardrails seemed secure. I never worried about our safety. Along the way, we stopped to inspect interesting, well-marked rock formations including Elephant's Head, which is shaped like an elephant's trunk. We took a break at a picnic table on a large, flat part of the trail, watching pigeons swoop across the gorge while we ate granola bars. After descending a long staircase to Table Rock, we met our raft tour guide. He handed us life jackets and told us to take our shoes off if we didn't want them to get wet. He'd been leading tours for eight years, since he was 14, and he assured us that no one had ever fallen out of the raft on his watch. We hopped in the inflatable boat, along with a father-and-son pair who had arrived just before we did. Then we floated down the river between the rock walls while our guide peppered us with chasm lore. Before 1996, visitors rode through the chasm in canoes. But in January of that year, devastating floods destroyed much of the chasm's infrastructure, including cables that helped to pull the canoes back up the river. Crews rebuilt bridges and safety rails, and inflatable rafts replaced the canoes. The 20-minute raft ride was smooth, though at one point we bumped around a bit in Class 1 whitewater. For Mira and Theo, the small rapids were the highlight of the trip; both said they wished that there had been more of them. Back on dry land, we declined a trolley ride back to the welcome center and decided to walk instead on the 1.5-mile Dry Chasm Trail. The rocky, wooded path took us through two riverbeds that had dried up thousands of years ago and gave us a chance to do some rock scrambling. By the time we got back to the welcome center, we'd worked up an appetite. Our rafting guide had recommended a local brewery, which gave both Jeff and I grand visions of shiny, metal casks and beer-battered onion rings. Alas, we discovered that the operation was smaller than we had imagined and closed on Sunday. We settled for a little café down the road in rural Keeseville that served farm-to-table fare. My apple-and-Camembert sandwich hit the spot. Jeff dug into his herbaceous falafel, and the friendly staff happily scrambled up a couple of fresh eggs for Theo. Unfortunately, the grilled cheese, made with red peppers, onions and parsley, was a little too gourmet for Mira. She enjoyed a bowl of locally made yogurt instead. We ate happily at a picnic table outside — until a feral cat jumped onto our table and started pawing at our food. Not exactly a zombie attack, but it drove us indoors. After we finished eating, we rode 20 minutes north to Plattsburgh to visit a man-made wonder: Target. The return ferry, from Plattsburgh to Grand Isle, was only 15 minutes and just as lovely as the morning ride. As we headed back home to Shelburne, Seb's Snack Bar in South Hero called out with afternoon ice cream cones. It was a delicious end to a sweet adventure. Cross Lake Champlain on one of these ferries: The Charlotte ferry goes to Essex, N.Y and takes about 25 minutes. 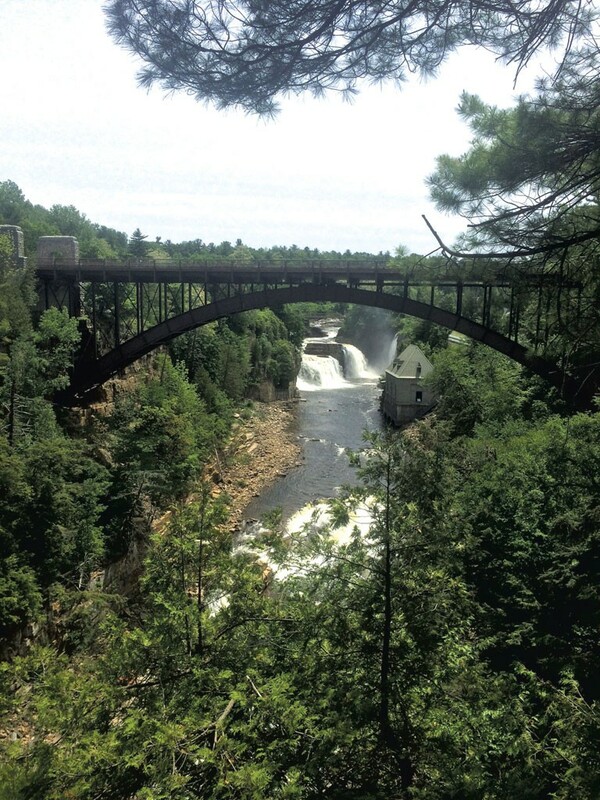 From Essex, it's about a 30-minute drive north to Ausable Chasm. The 15-minute Grand Isle ferry goes to Plattsburgh, N.Y. From there, drive 20 minutes south to the chasm. The Burlington ferry takes an hour to arrive in Port Kent, N.Y. From there, it's just a seven-minute drive west to the chasm. For ferry rates and schedules, click here. The Classic Tour of Ausable Chasm, which includes trail access and a raft tour (or tubing in July and August) costs $29.95 for adults and teens and $19.95 for children ages 5-12. The Premium Package — for thrill seekers ages 8 and up — also includes the Adventure Trail: cargo-net climbs, cable bridges and a harnessed walk along the edge of the chasm. That costs $49.95 for adults and teens and $39.95 for children ages 8-12. Wear sneakers or waterproof shoes if you're planning to hike the trails. Flip-flops aren't allowed. Pack towels and a change of clothes, just in case. No strollers are permitted on the trails. Our 5-year-old handled the hiking well, but the terrain, and the heights, might be challenging or intimidating for a younger child. Kids must weigh at least 30 pounds for the raft tour. Arrive early! We got to the chasm at 10 a.m. and encountered few other visitors. But when we returned to the welcome center around 12:30 p.m., the parking lot was full. Between noon and 2 p.m. during the summer months, groups may have to wait up to an hour for the float tour. We ate lunch at Clover Mead Café & Farm Store (933 Mace Chasm Rd., Keeseville, N.Y.) just a two-minute drive from Ausable Chasm. The tiny shop serves gourmet breakfasts, sandwiches and baked goods on Friday, Saturday and Sunday from 9 a.m. to 3 p.m. They also sell local produce and jams — and cheese and yogurt from North Country Creamery — from 9 a.m. to 6 p.m., Tuesday through Sunday. We brought home a tasty hunk of feta and some maple yogurt. Ausable Brewing Company (765 Mace Chasm Road, Keeseville, N.Y.), which opened last year, serves craft beers and sodas, plus Thursday-night tacos and barbecue on weekends. It's open on Thursday and Friday from 2 to 8 p.m. and Saturdays from noon to 8 p.m.
Essex, N.Y. is a cute town to explore if you're taking the Charlotte ferry. There's a small playground close to the ferry dock, and Essex Ice Cream Café (2134 Lakeshore Road) offers delicious scoops, plus coffee drinks and sandwiches. Noblewood Park in Willsboro (158 Lakeshore Drive), just a five-minute drive from the Essex ferry, has a large beach, perfect for a swim on a hot summer day. "Car ride! Let's go!" I called to my dog, Odin, pointing at the open car door. My partner, Tristan, and 7-month-old daughter, Elise, were already buckled in. Our 8-year-old chocolate Lab takes his time these days. He ambled over to the car and took his usual spot next to Elise's car seat. Little did he know, he was in for a treat: We were headed to Dog Mountain in St. Johnsbury, where canines are king. Our car was packed with supplies: a baby carrier, snacks and a sippy cup for Elise, a water bowl for Odin and a picnic blanket. We drove from our home in Marshfield to downtown St. Johnsbury, where we stopped at a deli for picnic fixings and cold drinks. We also picked up one of Odin's favorite snacks, a tin of sardines packed in olive oil. To reach Dog Mountain, situated about three miles from town, we turned onto a dirt road, then climbed a long driveway to the picturesque property. 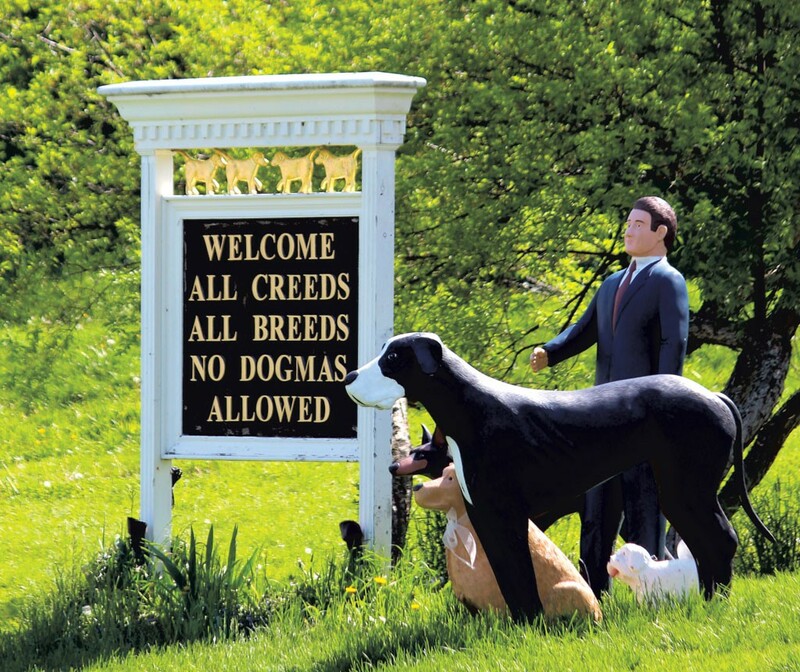 The 150-acre compound includes the world's only Dog Chapel, a large barn, hiking trails, gardens, ponds and an art gallery featuring the work of artist Stephen Huneck, famous primarily for his wood carvings and paintings of dogs. Huneck created Dog Mountain with his wife, Gwen. Sadly, this beautiful place has a tragic backstory: Huneck committed suicide in 2010, and three years later, Gwen took her own life. Dog Mountain is now run by a nonprofit organization with support from Burlington City Arts. We parked our car and headed for Huneck's gallery. Ben, the attendant there, told us that Stephen Huneck galleries once existed in every state in New England. The Dog Mountain gallery is the only one that remains. 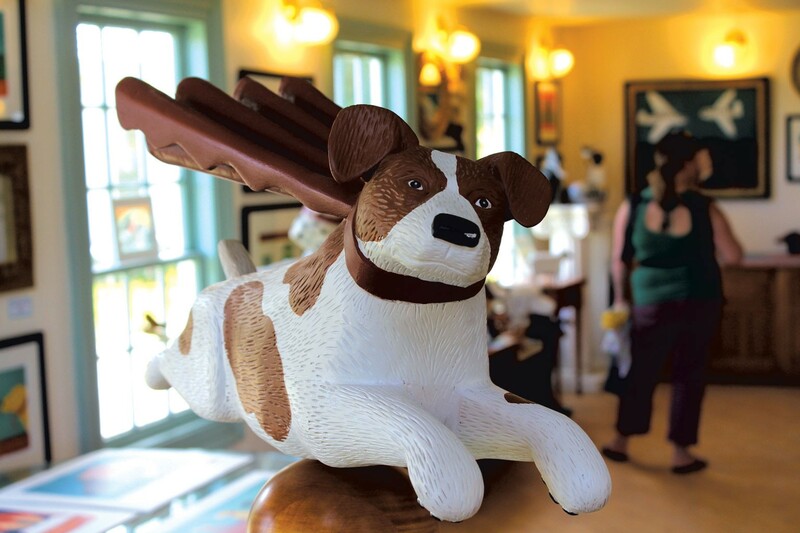 It's full of Huneck's whimsical, canine-centric carvings, handmade furniture, wood-block prints, books and T-shirts. My favorite print, "My Dog's Brain," shows a cross-section of a pooch's mind. It's divided into interests: food, bones, chasing cars and jumping up on visitors. In the book section, Elise and I found Sally Goes to the Beach, a picture book featuring a black Labrador retriever — Huneck's dog, Sally — who packs her bags and heads to the ocean. We already own several books from the Sally series and bought this one to complete our collection. Odin, who was welcome to wander the gallery, carefully investigated some life-size dog statues. But they didn't hold his interest for long. He soon found the bathroom, where he lapped up water straight from the toilet. Thankfully, Ben the attendant wasn't fazed. He even offered Odin a treat from the cookie jar by the register. 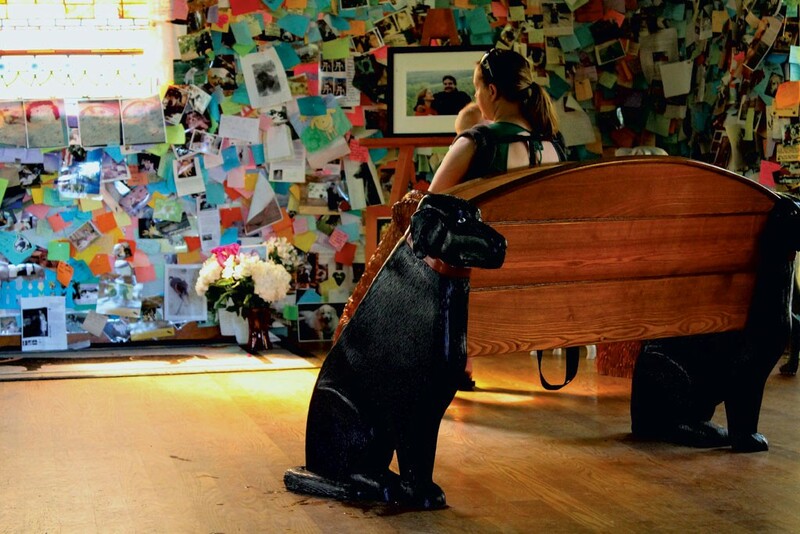 The nondenominational Dog Chapel, which we visited next, allows humans to memorialize their departed canine companions. Its stained-glass windows feature scenes of shared ice cream cones and pats on the head. The Hunecks opened the chapel in 2000, and since then every inch of wall space, from the baseboards along the wooden floor to the edges of the high ceiling, has been plastered with photos, notes and heartfelt remembrances. Some read, "You were the best dog ever," and "I miss you so much." Others conveyed wishes for eternal belly rubs and endless games of fetch. We sat in a pew bolstered on either side by dog statues while Elise babbled in my lap and Odin's nails clicked on the wood floor. The overwhelming outpouring of dog love brought both Tristan and me to tears. I felt lucky to be visiting the chapel with Odin still by my side. Soon our pup was standing in the open doorway, eager to explore the swimming ponds. Our thoughts turned to happier things, like walking the trails and playing in the sun. We left the chapel and found a picnic site, beside a pond with tennis balls floating in it. Odin dove right in while we munched on salads and sandwiches, and Elise played by our feet on the blanket. Half an hour later, a group of people and dogs emerged from the trails on the hill above us. We put away our lunch, stood and scooped up Elise so she wouldn't be underfoot. Our little girl squealed with delight as the new dogs joined us, sniffing, wrestling and chasing each other. Nobody interjected with commands or interfered with their games; the vibe was all about letting the dogs have a good time. Odin, clearly the oldest of the bunch, quickly lost interest in the energetic play, so we headed farther up the hill on a mowed grass trail, through beautiful fields of blooming purple lupine. We hiked a short loop, ending back at the gallery. Odin has spent countless hours accompanying us on our errands and adventures. He always seems content to be with us, even when the outings aren't fun for him. It felt really nice to devote a day to his enjoyment. As we drove back down the long driveway, I turned to look at Odin sitting next to Elise in the backseat. He was grinning ear to ear, his tongue hanging out of the side of his mouth. He had managed to get mud all over him, even on top of his head — and he couldn't have been happier about it. 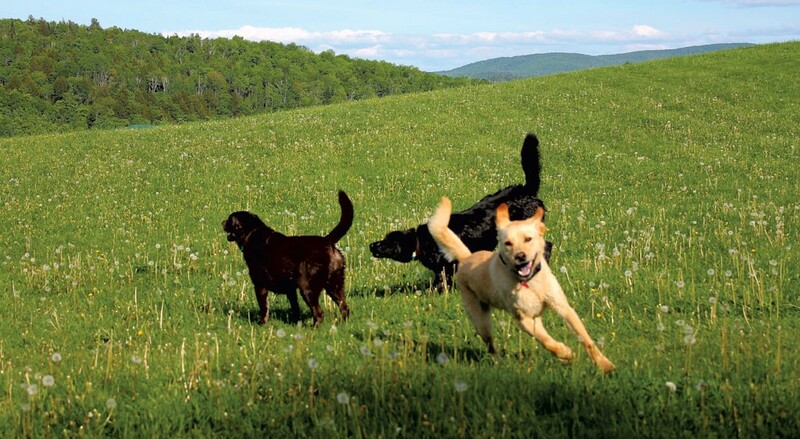 Dog Mountain is free and open to people and their dogs daily, from dawn to dusk. There are hiking trails, swimming ponds and plenty of tennis balls on site. In the gallery you'll find dog bowls and faucets. In the summer, the art gallery and gift shop are open Monday through Saturday from 10 a.m. to 5 p.m., and Sunday from 11 a.m. to 4 p.m. Dog Mountain hosts its annual Summer Dog Party on Saturday, August 1, from noon to 4 p.m. For more information, click here. Dog Mountain is all about the dogs. Families with young children should be prepared for dogs running free. There is a picnic table next to the chapel and ample grassy spots for picnics, but be prepared to pack up quickly if dogs arrive on the scene. Riley's Fish Shack (2165 Portland Street) serves burgers, chicken, fish and soft-serve ice cream, right down the road from Dog Mountain. Outdoor seating makes dining with Fido a breeze. Natural Provisions (537 Railroad Street) is a modern general store. This is the place to go if you forgot sunscreen or your water bottle. The deli in back makes delicious salads, sandwiches and desserts to go. Don't miss the kitchen-goods room full of colorful linens and gourmet products. St. J Food Co-op(490 Portland Street) is a health-food store with picnic provisions such as sausages, cheeses, breads, cold drinks and fresh fruit. There is also a bulk section for snacks like granola or peanut butter. St. Johnsbury Farmers Market, held on Saturdays from May to October in the municipal parking lot on Pearl Street, offers goods from local farms and artisans, plus live music and authentic Jamaican food. The St. Johnsbury Welcome Center (51 Depot Square) has visitor parking and a shady park with picnic tables and outlets for charging electronic gadgets. It also has city maps, tourist information, water and bathrooms with baby changing stations. Four Seasons Park and Playground is located on the corner of Main Street and Winter Street. The Fairbanks Museum & Planetarium (1302 Main Street) offers natural history exhibits for kids and adults, and an interactive kids' room. A gift shop is well stocked with educational toys. Find information on current exhibits and planetarium shows here. The art galleries at Catamount Arts Center (115 Eastern Avenue) are open to the public Monday through Saturday. Catch films and performances in the evening. Find a calendar of events here.